Our brewery is located at 1336 Phinney’s Lane in Hyannis and after an expansion project during the winter of 2016, currently consists of a 30 bbl 3 vessel system from Premier Stainless Systems. Fermentation/Cellaring includes: 2 x 60 bbl, and 9 x 30 bbl fermenters along with 2 x 60 bbl jacketed brites, 2 x 30 bbl jacketed brites , 1 x 20bbl single wall brite, 6 x 15 bbl single wall brites and 2 x 7 bbl single wall brites. We have a maximum annual capacity of approximately 12,000 barrels. We brew on average 8-10 times a week during the high season, and about half that during the off season. We self distribute our products within approximately 50 miles of the brewery – from Plymouth to Provincetown. In total we have about 500 accounts that carry our beer, roughly 350 bars or restaurants and another 150 or so package store/liquor stores that carry our beer. You can find Cape Cod Beer near you by checking out our beer finder! Our first year we had 12 customers and one employee (Todd) and delivered beer in Beth’s mini van – typically with their sons strapped in their car seats in backseat. Our original system was a 7 bbl direct fired DME copper clad brewhouse with 3 x 15 bbl fermenters (still in use today). Cape Cod Beer hired its first official employee (aside from Todd & Beth) in spring of 2005 to help Todd keep up with growing demand. and moved into our new space (3,000 sq ft) at 1336 Phinney’s Lane brewing on our original system with a total of 3 full time employees, including Todd. We got 2 more tanks delivered to help us meet demand. Beth Marcus was able to join the company full time as Cape Cod Beer’s Business Manager. We replace our trusty 7 bbl direct fire brewhouse with a brand new 15 bbl direct fire brewhouse from Premier Stainless along with 9 new tanks. We added more physical space in Winter of 2009, taking over 2,000 sq ft – expanding retail, office and production space. We added more 30 bbl tanks for a total of 9×30 bbls fermenters and 3×15 bbls fermenters and 9 bright tanks. We request and are given the go ahead from the Town of Barnstable and the ABCC for a pouring license allowing us, when invoked, to pour beer by the glass in our “tasting room”. Planning begins and this license begins to be put to use in 2013. Cape Cod Beer signs a lease and takes over an additional 4,000 sq feet at 1336 Phinney’s Lane in Hyannis. This is the building two doors down from our Retail space. This new space houses the brewery’s fermentation tanks and is also where the packaging of our beer takes place and includes a 1,000 sq foot walk in cooler. We begin canning our beer with the help of Iron Heart Canning, a mobile canning company based out of Connecticut. Initially, we offer only our Red and Blonde in cans but expand our canned offerings to all four of our year round beers in 2015. Following a banner summer for us and after the continued rise of demand for our beer, the decision is made to replace our 15 barrel brew house with a 30 barrel system in February 2016. The remaining three 15 barrel fermentation tanks and our old brew house is sold to the Jailhouse Tavern in Orleans. Cape Cod Beer installs a new 30 barrel brew house! 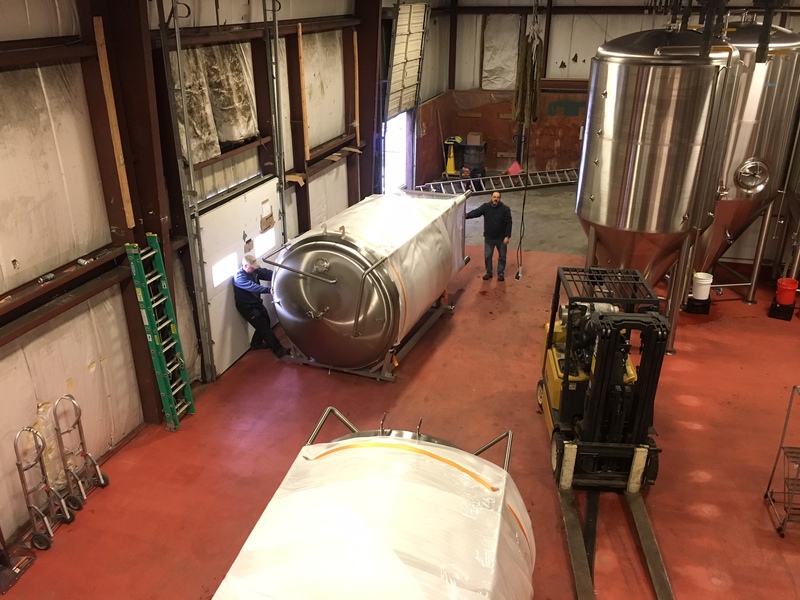 Cape Cod Beer replaces five 30 barrel fermenters and two 30 barrel brites with four 60 barrel fermenters and two 60 barrel brites, expanding fermentation and storage capacity!